I am sick of boats in Golden Sun games, remember the first game where only went on the boat once, that was the best thing ever, I'd rather just walk around the map to get to places, I want to play as Isaac, not a boat, and basically that's what you get with a boat. I'd rather just have walking. 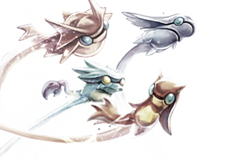 Oh and as for Soarwing, if that comes to fruition, then just make it like Fly in Pokémon. Re: No More Boating Please! I like boating in video games. If they made it go faster, that'd be great. Travelling by vehicle is really common place in RPGs anyway. Especially flying boats. I'm kind of tired of there being a storyline that says find a boat.